This condo has a master bedroom with a king size bed and a bunk room with twin bunks. The bunk room also has a bath with a walk in shower. Beach Retreat is a small quaint gated beach community featuring 44 condos. We have a beautifully landscaped pool and private beach. 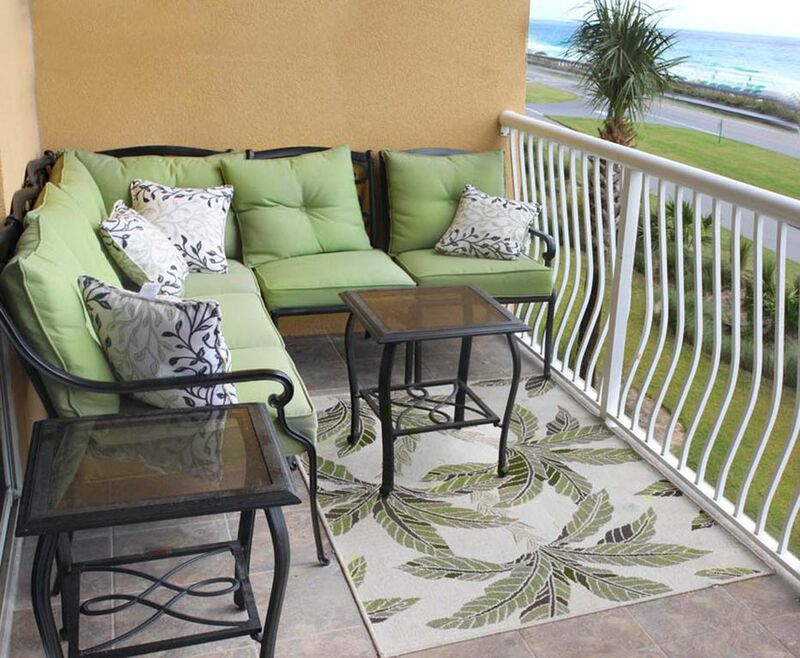 The unobstructed view from Beach Retreat 207 features the emerald blue green water of the Gulf of Mexico. The community also has a fitness center on site available to visitors. This unit has it all. Granite, Tile, Pet Friendly, Blu Ray Player in Living Room, Free Wifi, DVD's and Flat Screen TVS in other rooms. Everything was completely redecorated in 2011. Prices are subject to change until the condo has been reserved. Plenty of hot water, but the shower pressure is just ...okay. I would stay there again, the view is fantastic! The location is great, easy access to everything. The condo is tastefully furnished. Even though the weather was "bold," the condo was "beautiful"!!! Everything was comfortable and nicely maintained. We loved listening to the waves and watching everyone walk by as we enjoyed the incredible balcony. Its location keeps you sheltered from the wind, so you get a lot of sun...even when it's 40 degrees. During one pretty dramatic nighttime lightning storm, our view was spectacular! We fell in love with a new part of the Emerald Coast and will definitely be back to Miramar Beach. Favorite Place on the gulf! We booked our week long vacation here at the last minute because of Hurricane Michael and needing to cancel our previous 10-day vacation. We are so glad that we found this GEM on the gulf and we were able to bring our 2 puppies with us! Check-In was super smooth and our welcome email was very detailed and gave us absolutely all of the information we needed for our stay. Once inside, we were very pleased with the accommodations and the view... OMG... PERFECTION! The condo is super cozy and provided us plenty of towels and toiletries to get us started. The condo is very quiet and all of the neighbors that we met throughout our stay were very nice and pleasant. Beach access was right across the two lane highway and the free beach service sealed the deal! Great access to shopping and great restaurants was a plus, but we cooked most of our meals in the kitchen. We found some great seafood markets and grocery stores were very close as well. We will definately be booking again with these ladies! Very nice condo. Comfortable and nicely decorated. Kitchen was well stocked with the necessary cooking supplies. Nice balcony for enjoying your morning coffee, afternoon snack, or evening cocktail. Complex is located right across from the beach too. beautiful condo with a beautiful view! This was our second time staying at the Beach Retreat! We love this location! This was our first time staying in this unit and really enjoyed it! The furnishings were beautiful and it is very clean. The view is breath taking! The size of this is perfect for a family with kids!